Food will be served by the delightful Chickpea Sisters, a south London-based catering social enterprise company run by refugee and migrant women, and dessert by Heron’s Nest, a north London-based bakery making cakes with love! 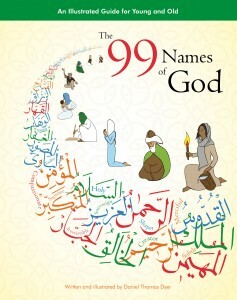 The 99 Names of God teaches children a holistic approach to Islam by highlighting the faith’s rich treasury of female voices, fostering a sense of God’s immanence as well as transcendence, promoting an appreciation of other religions, and nurturing ecological as well as social awareness. This ground-breaking family resource encourages children, parents and teachers to balance reason with intuition, critical thinking with creative imagination, social activism with self examination, and ritual prayer with meditative techniques. Join us to celebrate this new treasury with the author, and with music, food, and art.